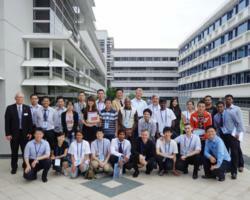 The inaugural FOCUS student leadership workshop in a program sponsored by SPIE and supported by Edmund Optics held earlier this month in Singapore brought together students and industry representatives. Presenters and attendees enjoy the inaugural FOCUS student leadership workshop sponsored by SPIE and Edmund Optics. Since the inception of SPIE in 1955, the society has helped industry meet their goals of building student relations and promoting education. High-level talks on laser medicine, advanced imaging, optical measurement, and laser markets complemented by visits with industry leaders and university mentors highlighted the recent inaugural FOCUS student leadership workshop. Sponsored by SPIE and supported by Edmund Optics, the event was organized by the SPIE Singapore Student chapter and held 11-13 July at the Nanyang Technological University. The FOCUS conference grant program was established to provide SPIE student leaders with funds to organize regional student leadership workshops offering professional development and networking opportunities. Two grants will be awarded by SPIE each year, and chapters are encouraged although not required to collaborate in the organization of the conference. Andrew Brown, SPIE Director of Global Business Development. During the conference, Dereniak presented SPIE scholarships to Lei Huang of Nanyang Technological University and to Eden Teoh Kang Min, Parthasarathy Sreemathy, and Watt Sook May of Raffles Girls' School. The Raffles team also won top prize for student presentations at the event. The scholarships are among a total of 140 such awards being presented by SPIE in 2012. SPIE Multimedia University Student Chapter (Malaysia). Since the society’s inception in 1955, SPIE has helped industry meet their goals of building student relations and promotion by supporting education and professional development through exceptional programming, and by connecting qualified students with employers.